This was what our morning looked like playing with dyed pasta noodles. Does this look gross or fun to you? I think I'm going to start committing to setting up a sensory play activity each Monday. If any extra time to prep is needed, it's nice to do it on a lazy Sunday afternoon so it's ready to go the next day. It will add a little sparkle to Mondays for everyone, don't you think? Keep reading below for instructions and tips of how to make dyed pasta. 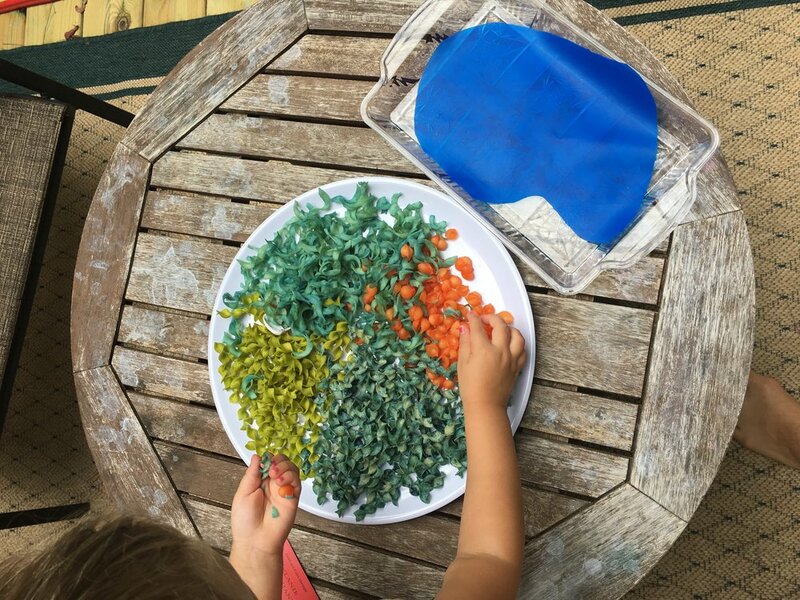 Believe it or not, I had never experimented with dyeing pasta for sensory play. If you’re already thinking this is too time consuming, don’t toss the idea out just yet. 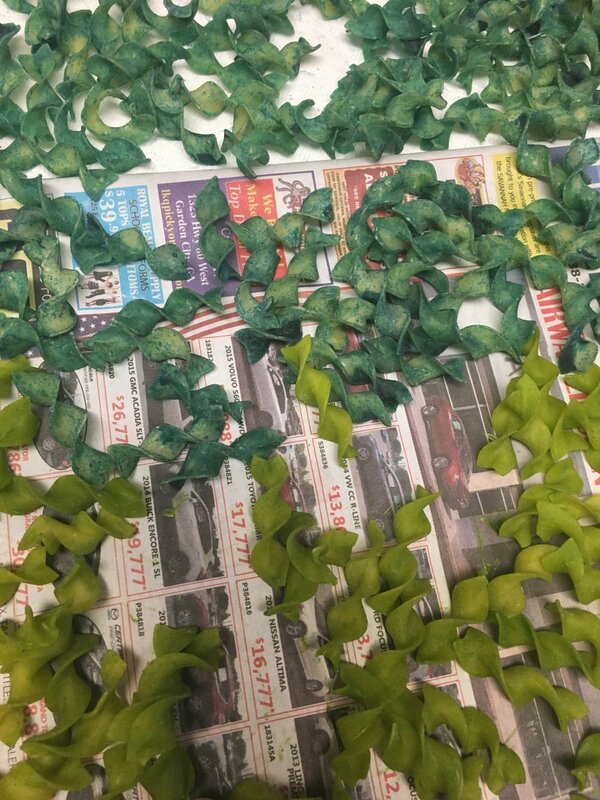 I tried out dyeing both uncooked and cooked pasta, so it took me around 45 minutes to do it 4 different ways. Our stove is terrible and takes a painful amount of time to heat up, so this contributed to extra time cooking the noodles. Stick with making 1 color at a time. Dye the uncooked pasta noodles only. Make a large batch of uncooked pasta all at once and if you use a portion with water play (food coloring will bleed), you still have a bunch left to reuse over and over again for play without water. It will last a long time if stored in an airtight container or plastic bag. Edible safe cooked dyed pasta. Cook pasta according to directions on your bag. Follow directions below for the uncooked dyed pasta. Dry on paper towels. I found it the wet noodles stuck more to newspaper when they dried, but either way you lose a few noodles. Sign up with your email address to receive news and updates from Dose of Play. Place 2-4 cups of dried pasta in a plastic bag/container. I purchased cheap egg noodles from a dollar store and used some shell pasta that was about to expire. First put 3 tsp of white distilled vinegar in a small bowl. I used a glass bowl. Next, add 15 drops (or more to get darker color) into the bowl with vinegar and swirl. This method helps the color go on more evenly. I used about 15 drops every 2 cups because I also wanted to make the color pop more for pictures. Feel free to use a little less. Pour color mix into your pasta filled bag/container and shake vigorously! I let my pasta dry overnight on a baking sheet lined with paper towel. TIP: If you want the look of the pasta pictured in the first picture of the slideshow below, you do not need to mix the vinegar and food coloring into a separate bowl first before add to the pasta. Just add the vinegar to the bag, followed by the food coloring drops. Digging right in! Water color change! 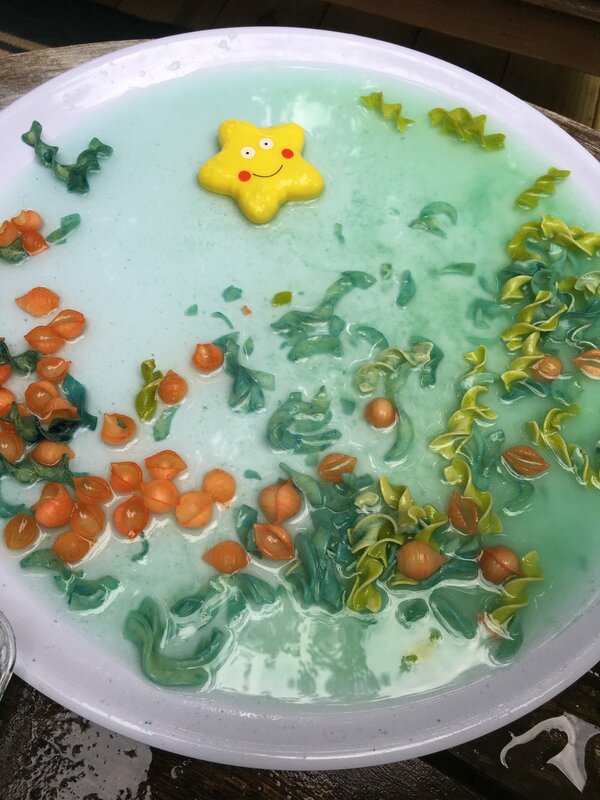 Truth: I chose to make this edible version in case our 1 year old got curious, but then later realized it wasn’t safe after my daughter wanted soap bubbles! Good thing he didn’t have any interest in bringing it to his mouth ;) As always, be sure to supervise young children around water and if you add any small parts that could be a choking hazard. Since our weather is hot here and we were using water, we set up outside on our back porch. I have a very inexpensive platter tray I I use for this type of play or for bringing treats to parties. The second tray was a recycled from our local dessert shop. My husband is always very sweet about surprising me with desserts when I’m pregnant. I love and hate him for it. The blue “pool/ocean water” is actually a super cheap place mat! I think it was a dollar found at a popular baby chain store. I included sea toys from my recent dollar store haul. 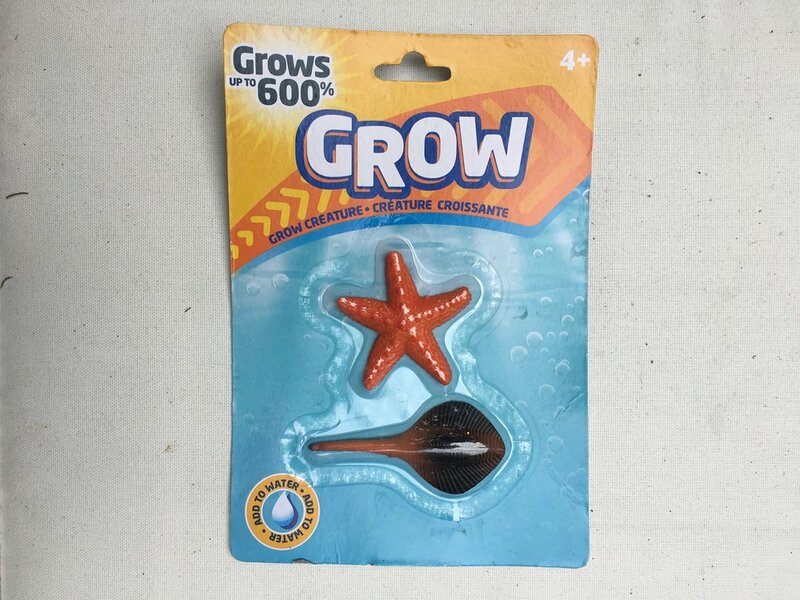 They actually grow if you keep them in water for a few days. Cheap scoopers from a party store and a dollar store spray bottle. Tip: I like to start with minimal/simple setup, then add a new element the next time to make it “exciting.” It’s not necessary to do so though every time you're setting up an activity. 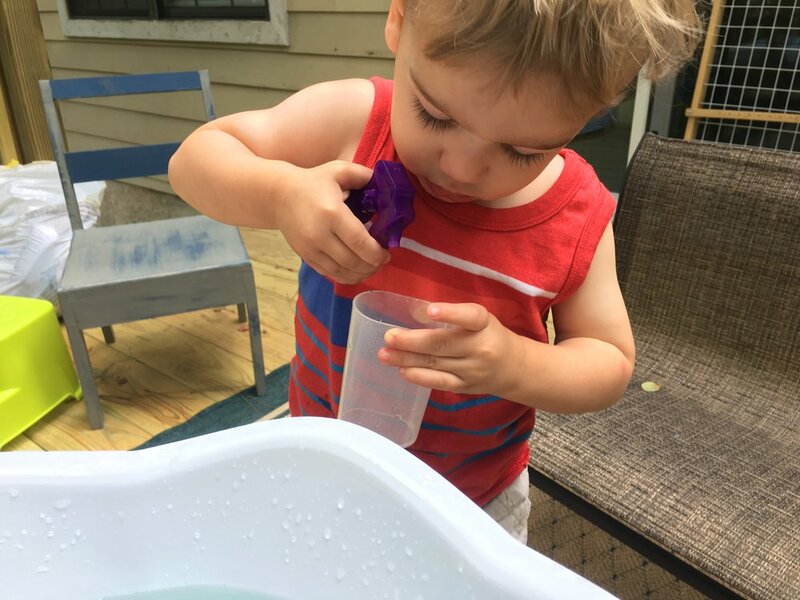 Kids will use their imagination naturally explore and play differently subsequent times. I do it partly because it’s fun for me to see their reaction! I think next time I might add a different food coloring color to the spray bottle or to the water bowl and let the kids see how the color changes once mixed with the pasta. 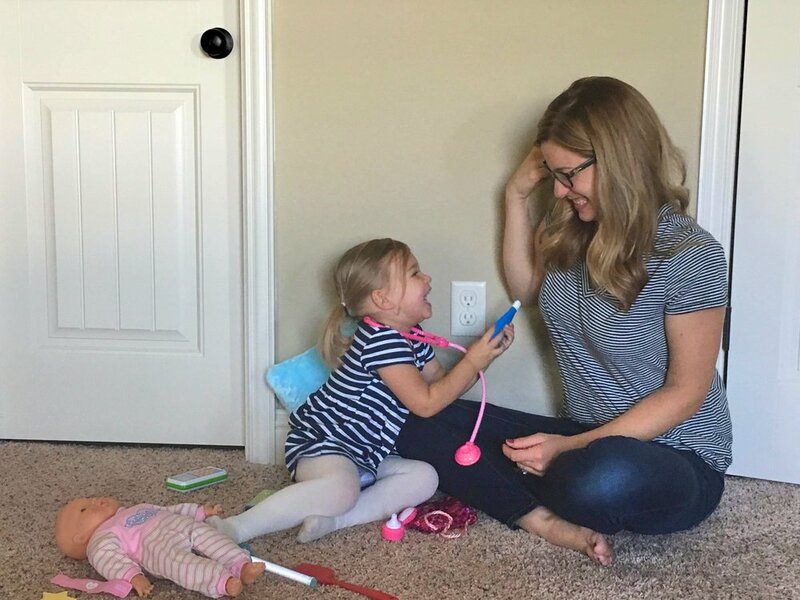 Be sure to stay social with Dose of Play! 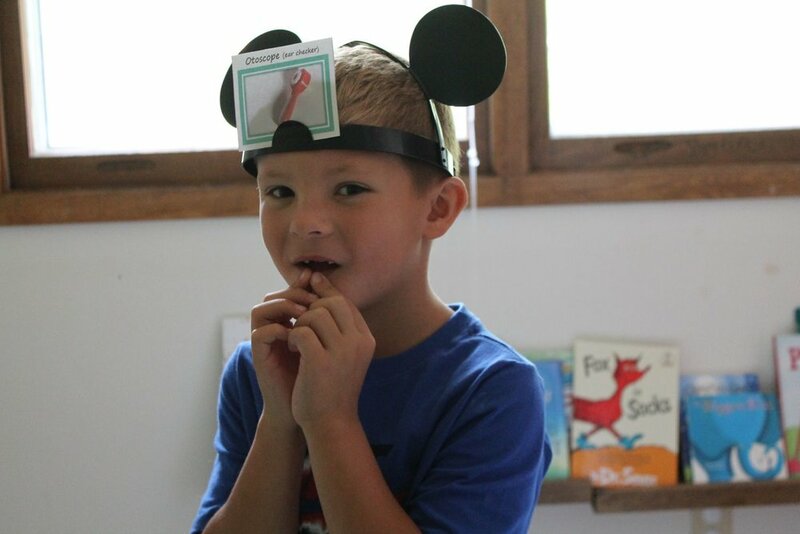 Let us know what you think or how you would use this activity in your play with kids!